Aluminum walking stick, folding, 4 parts for blind people (touch). Made in Bulgaria. 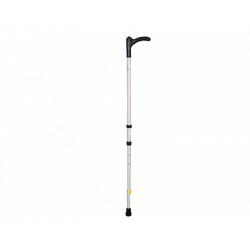 Stick straight, plastic handle, adjustable, 4 stage, for blind people (touch), made of aluminum. Made in Bulgaria. Stick with straight wooden handle made of aluminum. Fixed height of 80-95 cm. Made in Bulgaria.